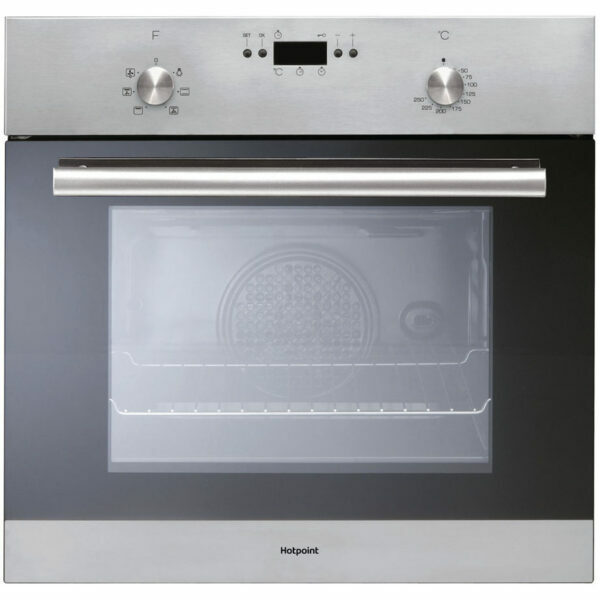 This Single Multi-function Hotpoint Oven is sleek and stylish and finished in modern stainless steel. Boasting one of the market leading names ‘ Hotpoint’ you can be sure this oven will have the quality to meet your needs for years to come. This oven is supplied with 1 shelf and 1 tray. If you would like additional shelves please select them from the options below. Whether you’re an avid baker, would-be chef or only cook when it’s truly necessary, this Hotpoint single oven is the perfect addition to your kitchen. Great for a medium-sized family, this 56L oven offers plenty of space when it comes to preparing family meals. It’s fan assisted and features intelligent temperature sensors which minimise variations in temperature to just 2°C either side of your chosen setting. That way, your results will be evenly cooked; whatever level inside the cavity your dish is placed. A defrost function and integrated grill with turbo grilling helps to make this oven more versatile and suited to both everyday tasks and menus that are more adventurous. It also features a digital timer with a clear LED display, giving you the tools to ensure you cook your meal for the perfect amount of time. Rated A for energy efficiency, you’ll save money and energy without having to compromise on the results. When it comes to cleaning, this oven has an easy-clean enamel lining which means you can simply wipe away splashes and spills between each use. With a ten-year part guarantee, you can spend more time cooking and feeding your loved ones knowing that your oven is built to last.